We purchased this 1940’s Hamilton 14k. 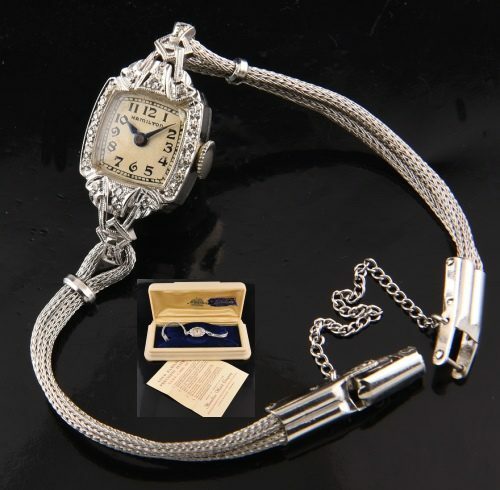 white gold and diamond watch from the original owner’s family. The dainty 14.25x31mm. lug-to-lug 14k. solid white gold case is encrusted with authentic diamonds. The original box and guarantee certificate are (amazingly) still present. This manual winding HAMILTON movement was just cleaned and is accurate. This watch fits up to a 5.75 inch wrist. This Hamilton has the original glass crystal with a scratch on it, but is is barley visible. We want to keep this watch original, so we didn’t put a new plastic crystal in in because it looks great. The cocktail watch is making a comeback!